Includes Mediant 1000B chassis, one Active/Standby pair of GE interfaces, a single module of 1 Fractional span E1/T1 (15 voice channels), single AC power supply and fans. Chassis can be expanded with any Mediant 1000 Voice modules such as FXS/FXO/BRI or T1/E1. Order M1KB-SWX module for additional 2 pairs of Active/Standby GE interfaces. Product does not include RS-232 cable (part #M1K-RS232) which is used to access the CLI for serial communication. 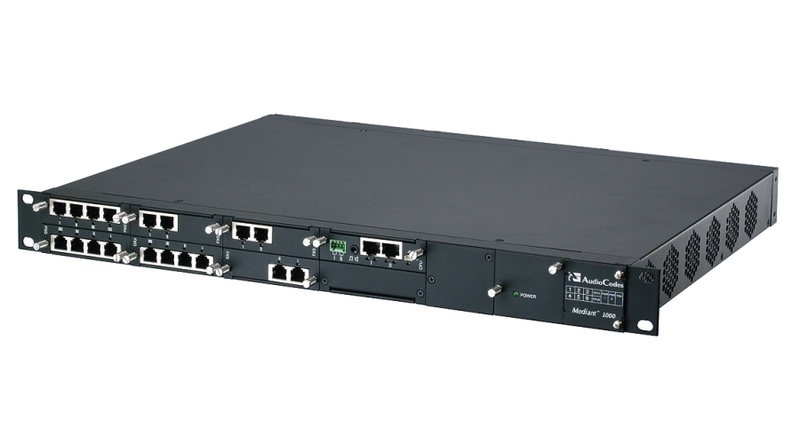 The Mediant 1000 is AudioCodes' cost-effective, converged wireline VoIP media gateway. Intelligently packaged in a stackable 1U chassis, it is designed to interface between TDM & IP networks in enterprises or small-scale carrier locations. Incorporating AudioCodes' innovative Voice over Packet technology, the Mediant 1000 enables rapid time-to-market and reliable cost-effective deployment of next-generation networks. The Mediant 1000 is based on VoIPerfect, AudioCodes' underlying, best-of-breed, media gateway core technology for all of its products. The Mediant 1000 provides superior voice-technology for connecting legacy telephone and PBX systems to IP networks, as well as seamless connection of the IP-PBX to the PSTN. In addition to operating as a pure media gateway, the Mediant 1000 can also host partner applications and serve as an IP-PBX platform. The Mediant 1000 is fully interoperable with multiple vendor gateways, Softswitches, gatekeepers, proxy servers, IP phones, Session Border Controllers and firewalls. Scale Up As Your Business Grows The Mediant 1000 matches the density requirements for small locations while meeting enterprises' and service providers' demands for scalability. The compact Mediant 1000 Modular Gateway is extremely scalable and supports multiples of 1, 2, or 4 E1/T1/J1 spans, 4 to 20 BRI ports or 1 to 24 analog ports in various FXO/FXS configurations. The Mediant 1000 also supports mixed digital/analog with media processing capabilities such as conferencing, play/record configurations. The Mediant 1000 can support a variety of telephony interfaces. The digital module can be configured as regular E1/T1/J1 interfaces, with up to 1 or 2 paired spans acting as life-line interfaces for switching to the PSTN in case of power failure or network problems. The analog module is available as regular FXS or FXO interfaces, where 1 FXS line can be used as a life-line interface for switching to the PSTN.